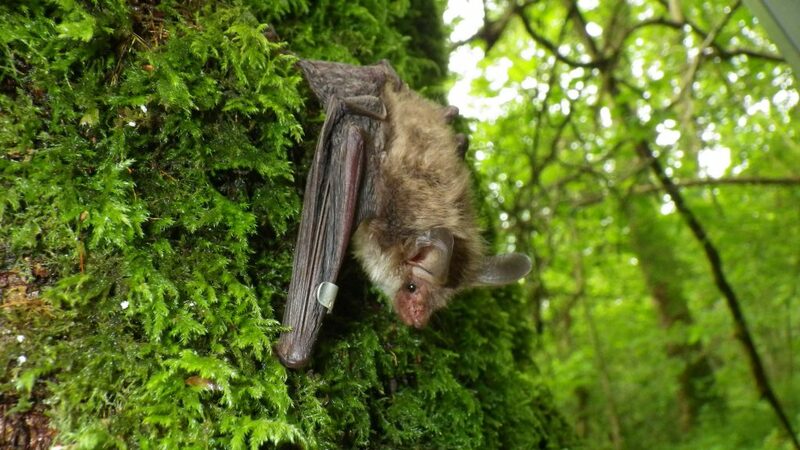 It was not long after VWT’s Henry Schofield had undertaken some radio-tracking of Bechstein’s bats in 1997 from a Sussex ‘swarming’ site, that the Dorset Bat group had some money available to purchase some bats boxes. Henry found that the bats he tracked (males) often roosted high in the trees. Looking back, it’s probably a good strategy to roost high up when you’re ‘calling’ for a mate rather than low down in dense vegetation. The bat group had enough funds to purchase 30 of the ‘new’ Schwegler 2fn bat boxes. I suggested we erect them ‘high-up’ in Bracketts Coppice, a deciduous woodland in north-west Dorset and a Dorset Wildlife Trust Reserve, in the hope that if Bechstein’s were present in the woodland they would find them – not that this was likely because there had only been around 100 Bechstein’s records in total in the UK in the past century. 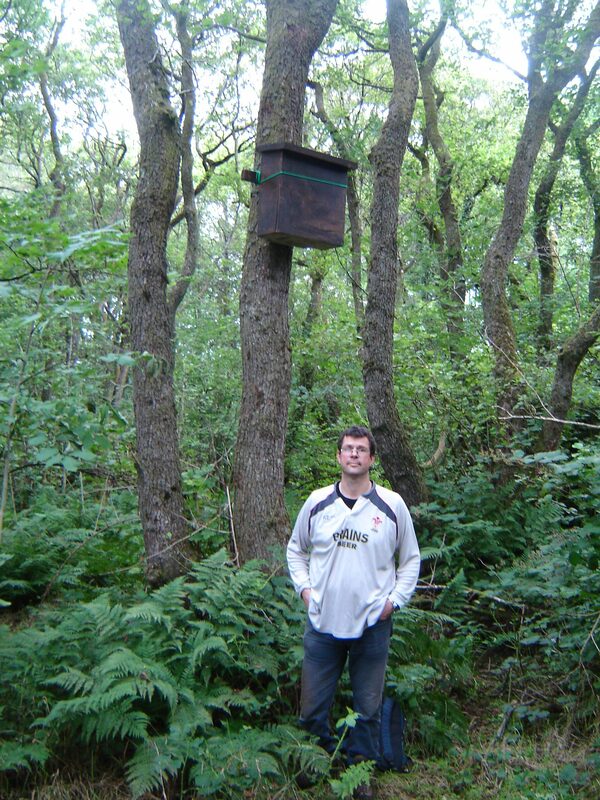 It was the 14th February 1998 when several members of the bat group helped carry and erect the thirty boxes into the woodland, not an easy task as the woodland had some steep, slippery slopes, a stream and some very boggy areas. The boxes, because of the data received from the radio-tracking exercise was duly erected at height far in excess of what would be described as ‘normal’; being somewhere between 6 and 8m off the ground. 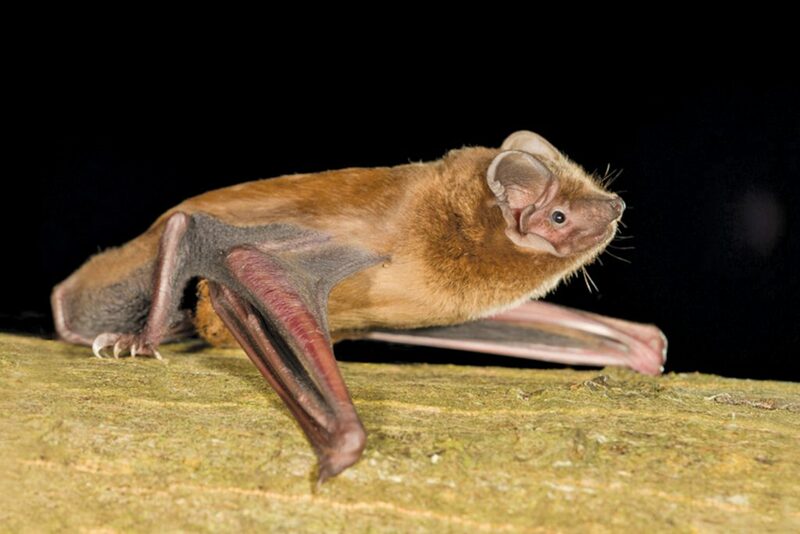 The boxes were left for three months and the first survey was undertaken in May, a single pipistrelle and 18 brown long-eared bats were recorded and a few boxes had bat droppings in – showing bats had called by and moved on. Over the years I have become quite confident at identifying some species of bat from just their droppings and at some of my other bat boxes sites the occasional male Bechstein’s bat turns up, but because of their rarity their dropping are ‘few and far between’. 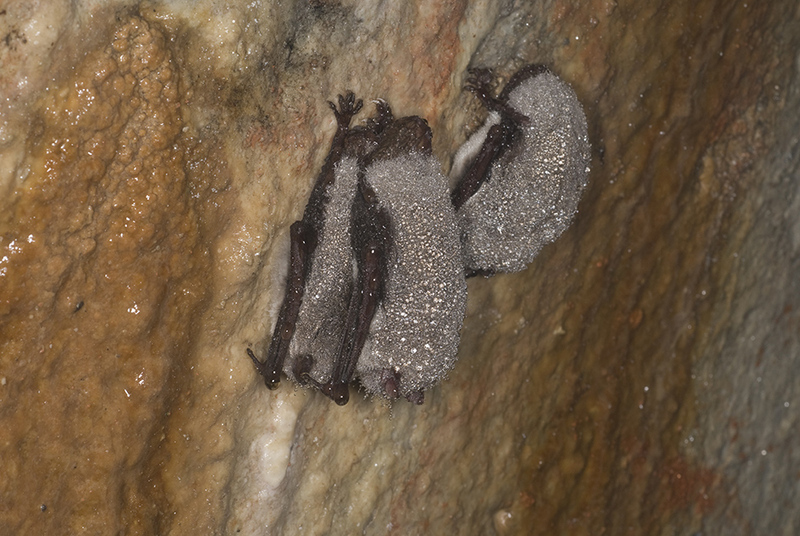 In one of the boxes on this day was a pile of droppings that looked suspiciously like Bechstein’s, but being as rare as ‘hens teeth’ I thought that this couldn’t be the case – there were far too many droppings for a single animal, and besides there was no known Bechstein’s colonies in bat boxes in the UK. We recorded the droppings as ‘unidentified species’. The next survey was in July. Maureen Keats from Dorset Wildlife Trust and I were checking the boxes to see what else might have turned up. Maureen was a founder member of the Wildlife Trust and also on the management Committee of the woodland. At the start of the day, Maureen had already mentioned that she had an ear infection, and it was affecting her balance; so she wouldn’t be climbing the ladder that day. I explained that this was not a problem as I was used to climbing a ladder from my days as a roof tiler. The woodland is partially grazed by highland cattle and through the centre of the woodland ran a barbed wire fence that we had to traverse. Half-way through the middle and top strands of barbed wire Maureen caught her trouser bottoms on the barbs, she fell flat onto the ground, her face planted fully into the leaf-litter, her back-pack weighing her down and both her legs high up, caught on the middle strand of wire. She was helpless. I did the gentlemanly thing and walked off…we were laughing so much it must have taken over five minutes to extricate her from the barbed wire. We carried on surveying and were delighted to find our first noctule: a big powerful bat with a beautifully smooth golden brown fur. Another box contained the brown long-eared bats we recorded in May, but in box number two I found something ‘quite exciting’: we never surveyed the boxes in numerical order, it was easier and quicker to do them in geographical order. In this box was a huge (and I mean HUGE) cluster of Bechstein’s bats. As I opened the box the cluster expanded into the space that became available and I spent a good couple of minutes trying to replace the door without trapping any of the bats’ feet or wings. Before I closed the door I managed to extract one of the bats and pop it into a cotton bag. With the calmest voice I could muster I called down to Maureen and told her that I had found something ‘quite interesting’ in the box! I proceeded down the ladder with my precious cargo. Confused Maureen asked why I had suddenly decided that long-eared bats were interesting. I asked her to take a closer look. Maureen looked and gasped; I could see the penny had dropped. She gasped even more when I told her that there were about 60 more in the box. Maureen was up that ladder as quick as the proverbial ‘rat-up-a-drainpipe’; it’s amazing how rare wildlife can cure ear infections. The droppings we had recorded in May as ‘unidentified species’ were almost certainly from Bechstein’s bats. Since the colony was discovered, Dorset Wildlife Trust has allowed VWT to study the bats, and we’ve now been studying them for some 20 years. Sadly Maureen passed away last month (March 2018) and I related this day at her funeral. I’ll never forget the great times and laughs we had together and the discovery of the ‘first nursery colony’ of Bechstein’s bats recorded from a bat box in the UK.